Sudan's ousted President Omar al-Bashir's career has been defined by war. He came to power in a military coup in 1989 and ruled what was until 2011 Africa's largest country with an iron fist. Although his government signed a deal to end that conflict in 2005, another one was breaking out at the same time - in the western region of Darfur, where Mr Bashir is accused of organising war crimes and crimes against humanity by the International Criminal Court (ICC). The arrest warrant has led to an international travel ban. However, Mr Bashir still made diplomatic visits to Egypt, Saudi Arabia and South Africa. He was forced into a hasty departure from South Africa in June 2015 after a court considered whether to enforce the arrest warrant. When he signed the peace deal with Garang and his Sudan People's Liberation Movement, he took pains to stress the deal had not been a defeat. "We did not sign it after we had been broken. We signed it while we were at the peak of our victories," he said. In the January 2011 referendum, about 99% of South Sudanese voters were in favour of separation. The independent state of South Sudan was declared six months later. While he agreed to let South Sudan go, his attitude to Darfur, where a conflict has raged since 2003 when rebels took up arms at alleged government discrimination, has been characterised by belligerence. Little is known about his private life. He has no children and took a second wife in his 50s. He married the widow of Ibrahim Shams al-Din, considered a war hero in the north - as an example to others, he said. As head of state, his focus largely remained soldiering - the political lead being taken by two other figures. Then Osman Ali Taha, a politician who negotiated the north-south deal, came to the fore. But his influence waned and the president took centre stage. 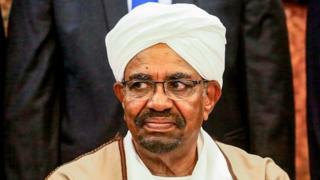 Sudan analyst Alex de Waal said Mr Bashir's longevity in office was probably down to the fact that powerful rivals in the ruling National Congress Party distrusted each other more than they did Mr Bashir. But political unrest gained momentum quickly. Nationwide protests first started in December 2018 after the government announced that prices for fuel and bread would rise. This turned into a wider call for Mr Bashir and his government to step down. Mr Bashir declared a state of emergency in February 2019, reshuffling his cabinet and replacing all state governors with members of the army and security forces. After months of unrest, Sudan's military stepped in and finally toppled Mr Bashir on 11 April 2019. However, any hopes of calming tensions quickly dissolved. Protesters vowed to stay on the streets after hearing that a transitional period of two years had begun under a military council. For a while during his presidency, there were pockets full of dollars as the oil flowed, controls were lifted and the telecommunications system revolutionised. But the economy floundered since the secession of the south, which took three-quarters of the country's oil with it. Belts are being tightened in Khartoum.